Each year, the Winter Speaker Series covers some interesting topics . 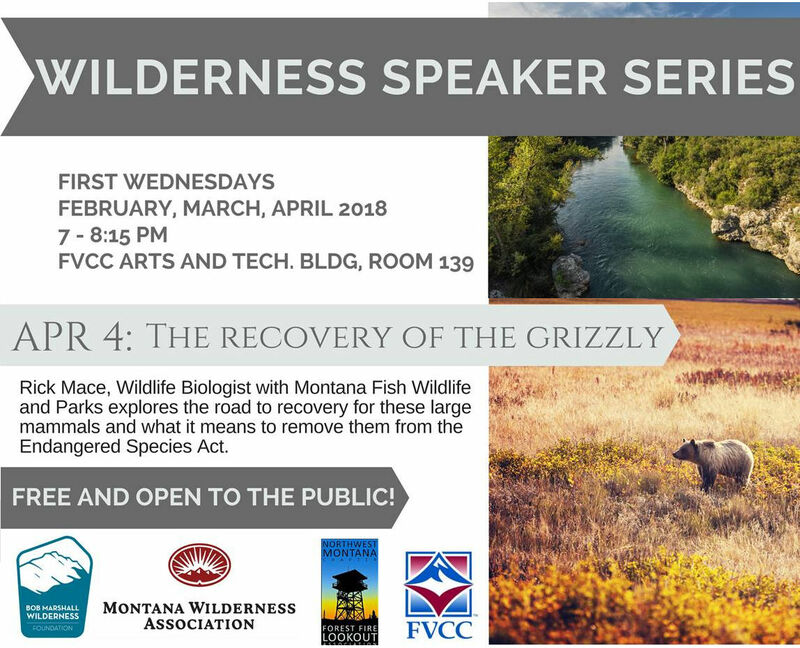 . .
Now in it’s 4th year, the Wilderness Speaker Series at Flathead Valley Community College invites Montanans of all ages to learn more about the history and ecology of the public lands here in the Treasure State. 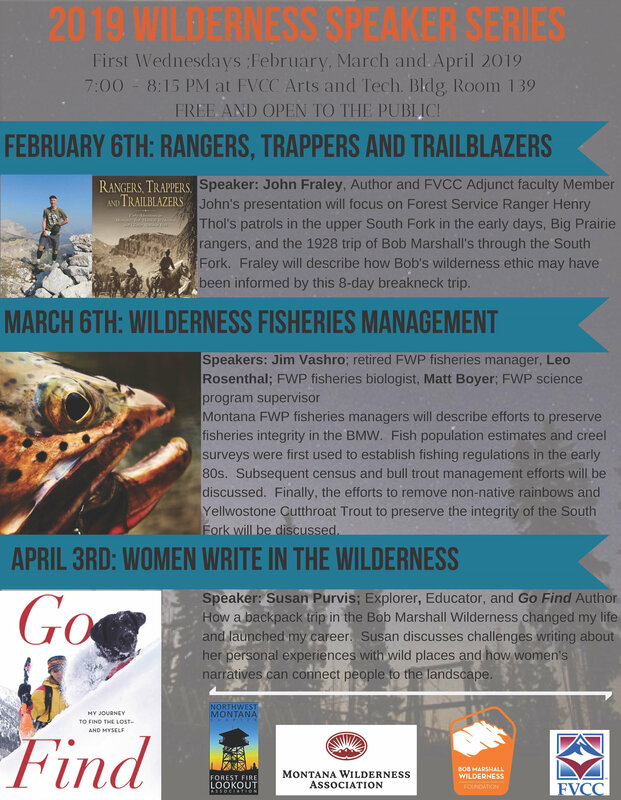 The Bob Marshall Wilderness Foundation and the Montana Wilderness Association will host these FREE public events on the first Thursdays of February, March and April from 7:00pm 8: 30pm at FVCC. All three events will take place in the Arts and Technology Building. Wilderness managers strive to allow the ecological role of natural fire in Wilderness areas. The 2015 fires on the Flathead National Forest provide examples of some of the challenges faced in fire management; including protecting wilderness values, public safety and access. Renowned conservationist Harvey Lock explores the “no holds barred”, Bob Marshall style declaration of love for the wild world and the landscape-scale management tactics it will take to save the precious ecosystems we have left. Photographer and naturalist Rick Graetz takes the audience on a stunning tour of the wild places in our own backyard through the eye of his camera lens and through the eye of history. Grab a friend and join MWA and the BMWF to learn more about the beautiful mountains and region that we call home. For more information, please contact Amy Robinson at 284-1747 or arobinson@wildmontana.org. Wilderness Speaker Series events are listed on the FVCC Continuing Education Calendar. The Bob Marshall Wilderness Foundation and Montana Wilderness Association are doing their wilderness speaker series again this year. Here are the essentials, as posted to the Missoulian . . .
…The series will explore topics involving the importance of wilderness for wildlife populations, recreation and the management of these lands. • Feb. 5: “Wilderness Management 101” with Deb Mucklow, district ranger and Bob Marshall Complex manager. • March 5: “The Wild is Consequential: Grizzlies, People and Sharing the Land.” Steve Primm will share stories and experiences working on grizzly and wolf recovery around Yellowstone National Park. He is founder and director of the nonprofit People and Carnivores. • April 2: “A Walk on the Wild Side: A 200-mile Hike in the Spirit of Bob Marshall” with Chris Peterson, a reporter for the Hungry Horse News and publisher of Glacier Magazine. Last year, in commemoration of the 50th anniversary of the Wilderness Act, Peterson partially retraced Marshall’s 288-mile hike through what is now the Bob Marshall Wilderness. See bmwf.org or wildmontana.org for more information. The Montana Wilderness Association announces their final presentation in this years’ Wilderness Speaker Series . . .
On June 22, 2012, three days after retiring from the Forest Service, Jonathan Klein slid his canoe onto the waters of Canada’s Churchill River and began a 700-mile solo canoe trip that would take him from Saskatchewan to the Hudson Bay. Jonathan’s seven weeks on the Churchill tested him mentally and physically, nearly got him killed by black bear, and gave him ample time to reflect upon the value and meaning of wilderness. Please join us for this final presentation in our Wilderness Speaker Series. Our own Frank Vitale will be a panelist at the next MWA “Wilderness Speaker Series” presentation. Here’s the official announcement . . .
Our third presentation in our Wilderness Speaker Series will be this Thursday night! Join MWA and the Bob Marshall Wilderness Foundation for an insightful intergenerational panel discussion that will encourage audience participation.